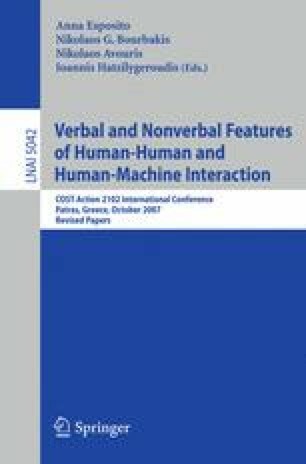 This study investigates how the psychological notion of affordance, known from human computer interface design, can be adopted for the analysis and design of communication of a user with a Virtual Human (VH), as a novel interface. We take as starting point the original notion of affordance, used to describe the function of objects for humans. Then, we dwell on the human-computer interaction case when the object used by the human is (a piece of software in) the computer. In the next step, we look at human-human communication and identify actual and perceived affordances of the human body and mind. Then using the generic framework of affordances, we explain certain essential phenomena of human-human multimodal communication. Finally, we show how they carry over to the case of communicating with a ’designed human’, that is an VH, whose human-like communication means may be augmented with ones reminiscent of the computer and fictive worlds. In the closing section we discuss and reformulate the method of cognitive walkthrough to make it applicable for evaluating the design of verbal and non-verbal interactive behaviour of VHs.